You can’t go to the Philippines and not eat rice cakes. We had our share of just about every way rice can be made into cakes. We were lucky to find the one in the center of the photo above, it is called “patupat”. It is glutinous sweet rice that is cooked in a vat of sugarcane while it is being boiled down to become raw sugar. I remember seeing the process of extracting sugarcane juice and collecting it in a huge vat with fire blazing under it where it boils until it is reduced and thickened. It is in this mixture that “patupat” is cooked. Rice is encased in these square packets woven from bamboo leaves, and dropped into the boiling sugar cane to cook and absorb the unique sweetness of raw sugar cane. A recipe is available here. Thanks to my cousin Joy who hunted these delicacies down in La Union and delivered them to my grandmother’s house just so we could have a taste of it. Suman – glutinous rice, coconut milk, salt, wrapped in banana leaves and steamed. Kankanen – this goes by different names. Kankanen is the generic Ilokano term used to describe this rice cake which consists of glutinous rice cooked in coconut milk and sugar and topped with either coconut jam or the solids that are formed from reducing coconut milk and sugar called ‘latik’. Stel made Bibingkang Malagkit not too long ago. Click on the link for the recipe. Puto Bumbong – this purple concoction was delicious! I forget exactly where my cousins found this now, but I know it is somehwere in Pangasinan. 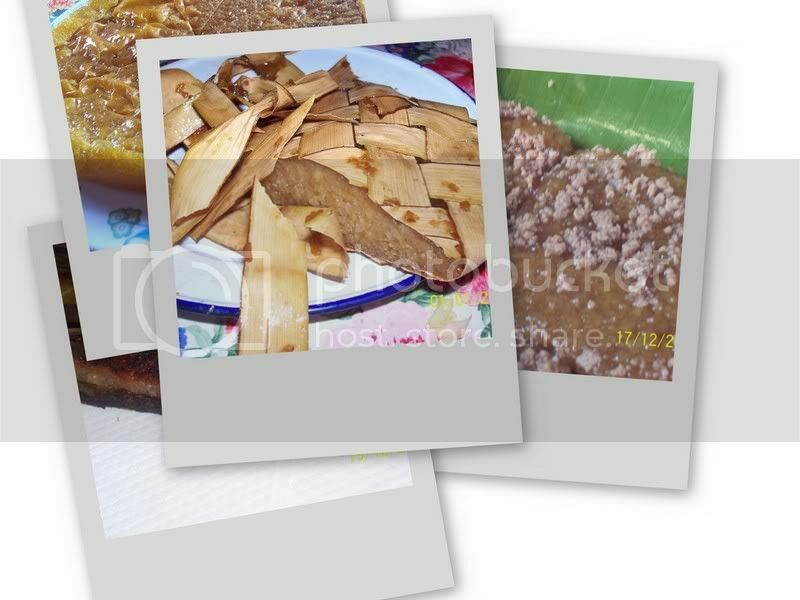 The Pinoy Cook has a very informative post about this and the other rice cake classic, Bibinka. Tupig – made from glutinous rice and coconut wrapped in banana leaves and baked over charcoal. Bucaio has a great post about this on her blog. There are also the various baked products like ube cake, buko pie, mamon, enseymada, pan de sal, and more that I can’t remember at this moment. It’s no wonder we all gained weight despite the heat! Click here for another photo of rice cakes from my friend Emer. Looks like you had a great time. I can’t wait to see the rest of the pictures as well as well as recipes. How warm was it? welcome back, Jmom! i know, i know, you had a grand time. vacations to the Philippines always involve eating fests. i can’t wait for the rest of your pictures. was it your kids’ and hubby’s first time there?